For the second year in a row, the Oregon Zoo earned three major honors at the Daily Journal of Commerce’s annual TopProjects ceremony, held at the Oregon Convention Center yesterday. 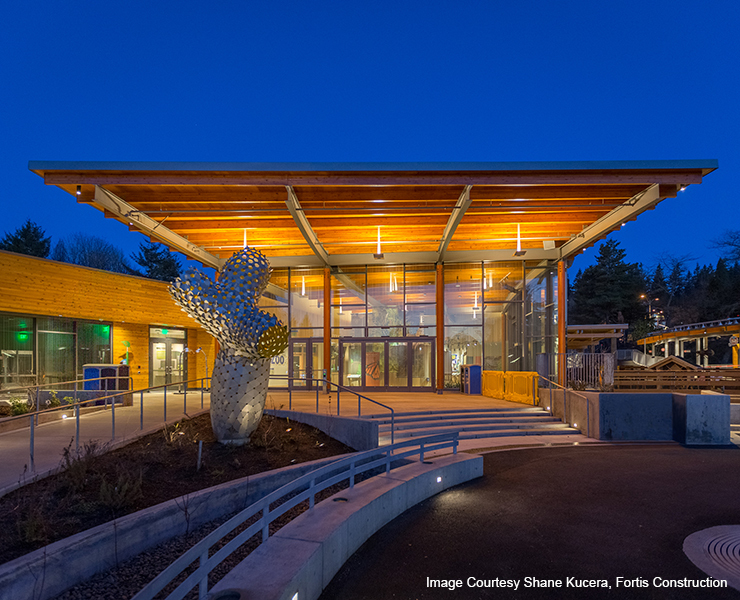 The zoo’s new Education Center — designed to inspire young minds and serve as a regional hub for conservation — won the Energy Trust of Oregon’s High Performance Building Award for new construction, as well as third-place honors for public projects and the People’s Choice Award for public projects, voted on in real time by event attendees. The Education Center was the fifth of eight major projects made possible by the community-supported bond measure promoting animal welfare, education and sustainability. The first of these improvements — the zoo’s veterinary medical center — was also a TopProjects winner, taking first-place honors for public buildings in 2012. And last year, Elephant Lands was named 2016 Project of the Year while also earning the top award for public projects and runner-up honors for the People’s Choice Award. The Education Center provides a welcoming entry and staging area for the thousands of children who participate in zoo camps and classes each year, and expands the zoo’s conservation education programs and activities through partnerships with the U.S. Fish and Wildlife Service, USDA Forest Service, National Wildlife Federation, the Intertwine Alliance, Portland Audubon and more. The center’s many earth-friendly design features — including more than 700 solar panels, salvaged building materials, bird-friendly glass and a rain-harvest system —model sustainability measures and make the facility itself a teaching tool. The zoo is applying for Leadership in Energy and Environmental Design (LEED) Platinum certification for the new center, the highest rating from the Green Building Council. To learn more, visit oregonzoo.org/edcenter.